Jill Talbot‘s writing has appeared in Geist, Rattle, Poetry Is Dead, The Puritan, Matrix, subTerrain, The Tishman Review, The Cardiff Review, PRISM, Southword, and others. Jill won the PRISM Grouse Grind Lit Prize. She was shortlisted for the Matrix Lit POP Award for fiction and the Malahat Far Horizons Award for poetry. Jill lives on Gabriola Island, BC. Photographer’s Note: After deep heartache and contemplation, the speaker in this poem pensively writes down the reasons NOT to surrender to self-destruction. Through this cathartic process, there is strength, determination, hope, and the will to keep going. 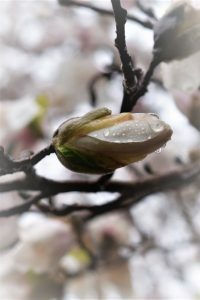 I’m pairing this poem with a photo of a new magnolia bud after the tree had weathered a late winter storm, a second heavy frost, high winds and pounding rain. Although it was beaten down and weary, it never gave up. It persevered and blossomed again, much like I feel the speaker in the poem suggests.